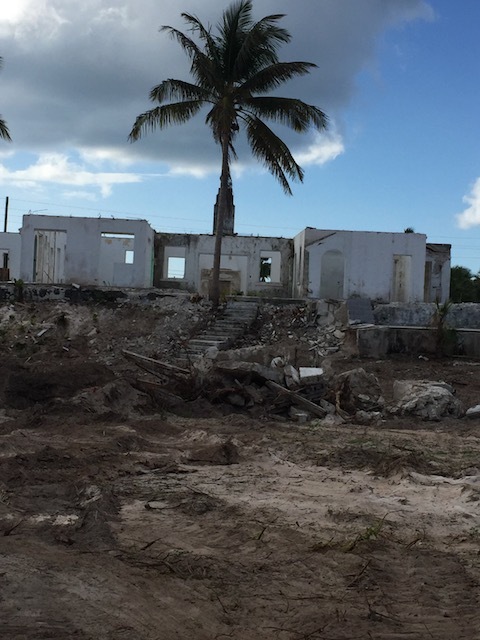 What a treat this week to write about The Potlatch Club here in Eleuthera – building on a great history….. 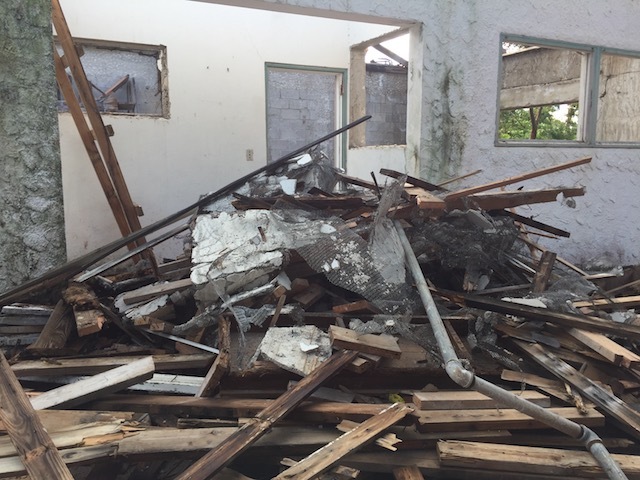 The new owners Hans Febles and Bruce Loshusan have started work on renovating and restoring the 12 acre property and it is exciting to see what is being done and hear of their plans. I have written before about the old Potlatch Club and at the time of writing Hans and Bruce were just completing on the sale. Now work is under way and I had a chance to talk with Hans about what is happening right now. Happily they are retaining the original name and are working on a schedule of opening in January 2018. The first phase will consist of 12 rooms along with 3 renovated existing houses. There will be a spa / gym, a hair salon, restaurant and bar – oh yippee ! – how exciting …. Eventually there will be a total of 30 rooms – that will be made up in phase 2. The main building was actually constructed in the 1930’s and the others between 1947 – 1965. 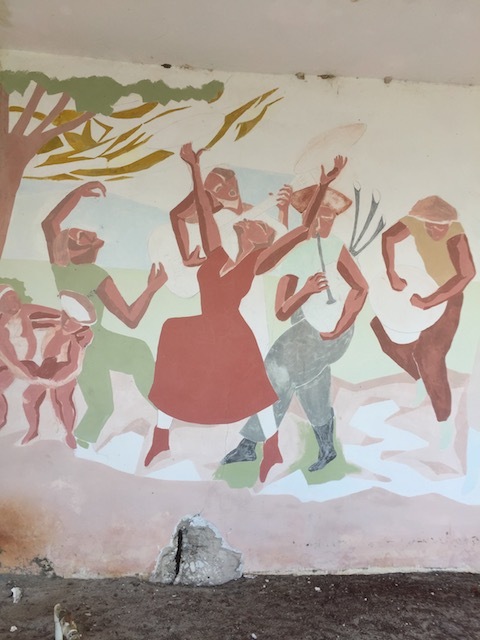 Furthermore Cottage – what a great name – still has an original mural painted by architect and designer Ray Nathanial and this will be a focal point in this property. 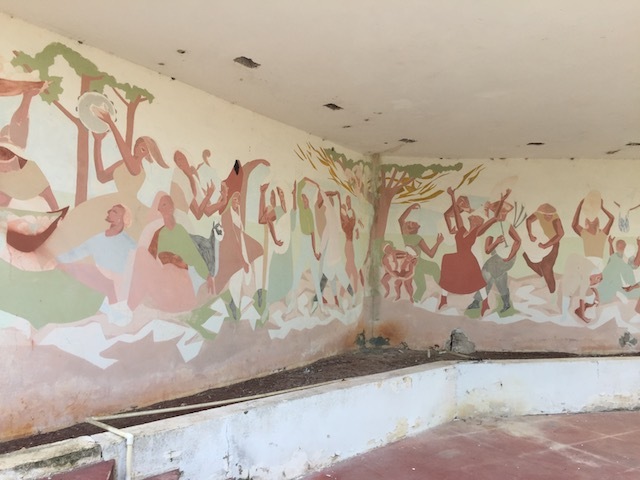 Some of the detail of the unfinished mural….. They plan to refurbish the existing pool as well – the construction of the buildings and facilities is first class – although the roofs were in a terrible state on some of the buildings the main construction is totally sound and will last many more years. 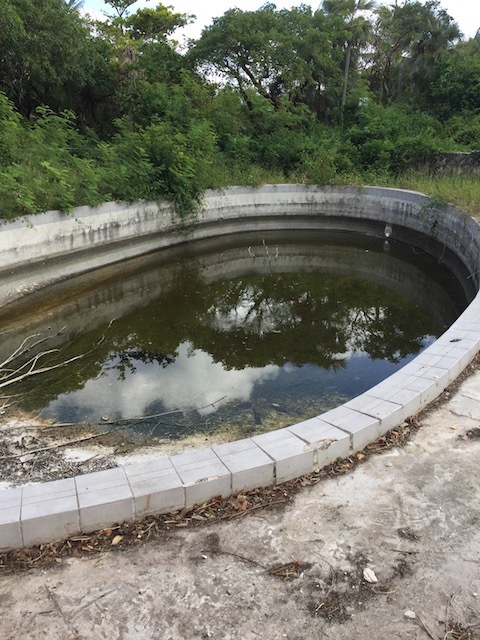 The main swimming pool – built by Gunnite Pools in Nassau in the 50’s or 60’s ? this can be renovated – built to last ! Fortunately Hans Febles has plenty of experience in both the Bahamas and the Caribbean. He is originally from Cuba but most recently was the manager of Great Harbour Cay for several years. Prior to that he managed Cutlass Bay in Cat Island and well as being involved in Pigeon Cay Resort – also on Cat Island. He has worked in Trinidad and Tobago, Curaco, and Tortola in the British Virgin Islands. So if anybody is more suited to seeing through this challenging project here on the island I don’t know who it could be. Another view down to the ocean from the site – imagine this in 12 months time ! I asked Hans what he thought their biggest challenge would be and he answered thoughtfully that bringing tourists to where there are generally so few amenities could be hard – people often want a lot of things to do – but I’m sure that the product they are developing will attract plenty of tourists both new and existing. 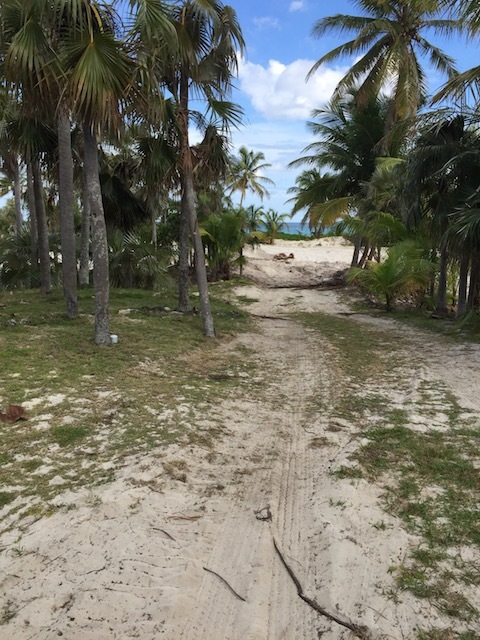 I often say to our renters that Eleuthera is a place to come and be – rather than a place to come and do ….. Relax , chill out and just take a good few long deep breaths…..
We all wish Hans and Bruce good luck and courage to see this lovely project through – of course there will be frustrating times – but Hans has such valuable experience I know that it will be a real success. We are all delighted to watch the progress to the re-opening of a gem from the past in it’s new incarnation. 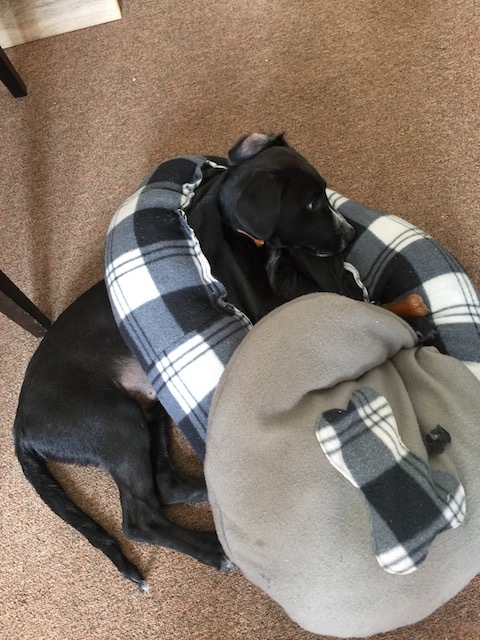 Sorry folks – you know I am going through a bit of a puppy crush phase and so here is Rudge actually wearing his office bed as a necklace – he chewed out the base of it ! Across the pond in London this week……..
Love this post and have wanted to walk around the site…last time I tried it was so overgrown I had picker feet! RUDGEY! No need of an office shredder at Colman Designs, right? You have a very good idea I know of how good he is at shredding ! it is still pretty overgrown in parts – but very exciting to see …. 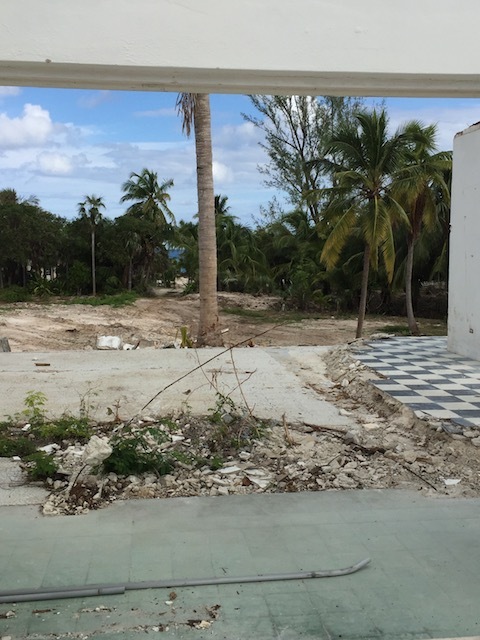 My husband and I have been coming to Eleuthera for 16 years and every time we drive past the Potlatch club he dreams of bringing it back to life. We look forward to seeing the progress when we arrive in April ! So pleased to hear that you enjoy the blogs and hopefully you will see some progress by April. Thanks…. What heaven seeing the photos of the beloved Potlatch Club! Thank you ever so much! I wondered about the swimming pool. Boy! Time flies when you are having fun. All those years gone by and the structures are still standing just waiting for their TLC. So enjoyed the update and Rudge! What can I say? It was so exciting getting a tour of Potlatch and hearing of the plans….. So well built – a real testament to the skills back then…..
Kathy! If I remember correctly, didn’t you do a previous blog on the history of Potlatch? What is the link to it? Would like to reread…thanks! Rudge is rippingly bigger by the week. See you soon. Here is the link Donna – and top of the class for remembering ! Now you just have to get him to say – When we move to Eleuthera ! The mural is amazing. I hope that will be restored. Yes – it will – stunning isn’t it ! I was a guest at The Potlatch Club back inits glory days, in the 1960’s. What a bit of pure perfection it was. Especially the food — chef Peter von Stark was a genius. I was only a teenager — after all, it WAS over 50 years ago! — and I loved it, even though there wasn’t all that much for a teenager to do, except swim and drink — yes, as a teenager. That wasn’t such a good idea.